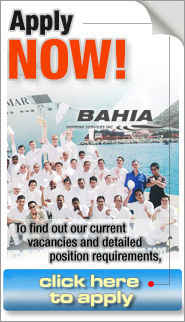 About Us | Bahia Shipping Services Inc.
5th Floor Ma. Daniel Bldg. 470 San Andress cor M.H. Bahia Shipping Services, Inc. (BSSI) or simply Bahia was registered with the Securities and Exchange Commission (SEC) in December 1987 and started deploying Filipino seafarers in January 1988 for then principal, Blackfriars Shipping Co. Ltd. Bahia then provided seafarers for only five vessels, now the company has grown to be one of the leading providers of seafarers for foreign principals and continue to grow to provide employment to most Filipinos. To provide our Principals with first-rate Filipino seafarers. Bahia Shipping Services Inc. is a company committed to recruit and supply STCW certified, competent, disciplined and hardworking Filipino seafarers for our foreign Principals. We are committed to uphold the best interest of the Filipino seafarers and to continuously promote the Philippines as a significant source of seafarers in the global labor market. To provide qualified and well-trained crew as required by our Principals in manning their vessels, and to meet the applicable statutory/regulatory requirements to ensure ship’s operation and protection of the marine environment. We at Bahia Shipping Services Inc. were incorporated with a set of core values embodied by the Chairman of the Board and continues to be the standard of its employees. We steadily adhere to strict moral and ethical codes in performing our duties and in interaction towards our customers. The company duly recognize the valuable contributions of the crewmembers. They are indeed the greatest assets of the company. We owe to this loyal seafarers the success of the company. MEMBER; Filipino Association for Mariners’ Employment (FAME), the largest association of manning agencies in the Philippines since 1994. We are POEA Top Performer Awardee for 2002 and 2006. Given to Bahia for its commendable performance and accomplishments. Two citations were likewise given in recognition to the agency’s promotion and creation of employment opportunities for Filipino seafarers. We are Bureau Veritas Quality International certified since 2000. We are an accredited Marlins English Test Center since February 15, 2007. Since 2002, Bahia processed contracts in-house. Giiven as a privilege by POEA due to the volume of seafarers regularly deployed, and as an incentive due to the awards and citations received. Since 2003, Bahia is an accredited PDOS Training Center. 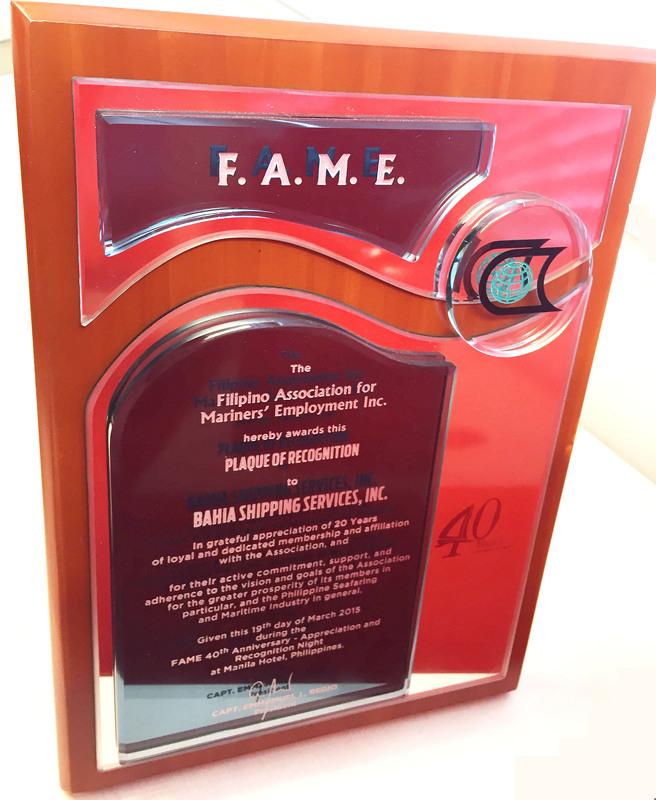 Bahia was awarded last March 2015, a “Plaque of Recognition” in grateful appreciation of 20 years of loyal and dedicated membership and affiliation with the Association and for the active commitment, support and adherence to the vision and goals of the Association for the greater prosperity of its members in particular and the Philippine Seafaring and Maritime Industry in general. "Fred. Olsen Cruise Lines has defined and refined the cruise experience, and judging by the number of passengers that come back time and again, Fred Olsen Cruise Lines seem to have styled it to perfection." “Yinson Production AS is committed to the highest standards with respect to Health, Safety and Environmental Protection and their objective is zero accidents throughout the operations. Its vision is to become a preferred long-term partner for oil companies and/or oil field developers through a commitment to quality, adhering to long-term values and seeking continual improvement to the services it provides." 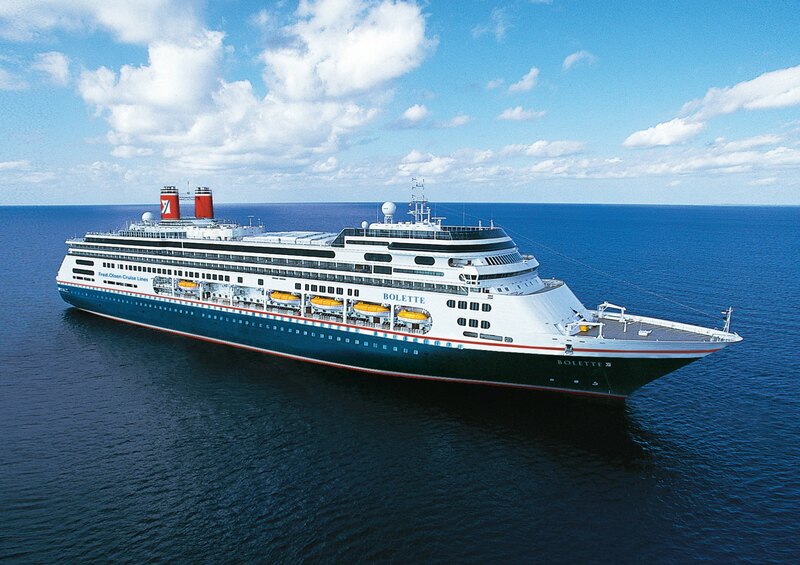 "Carnival is "The World's Most Popular Cruise Line", with 25 ships operating 3 to 18 day voyages to The Bahamas, Caribbean, Mexican Riviera, Alaska, Hawaii, Canada, New England and Australia." © 2016 Bahia Shipping Services Inc.
Bahia Shipping Services, Inc. (BSSI) or simply Bahia , was registered with the Securities and Exchange Commission (SEC) in December 1987 and started deploying Filipino seafarers in January 1988 for then principal, Blackfriars Shipping Co. Ltd. Bahia then provided seafarers for only five vessels, now the company has grown to be one of the leading providers of seafarers for foreign principals and continue to grow to provide employment to most Filipinos. Copyright © Bahia Shipping Services, Inc.